Congratulations to Joe and his wife Val! They have a new addition to their family - Sammee! Their new bundle of joy is part corgi and yellow lab and was adopted just today. Joe e-mailed me the picture tonight and I showed it to Paula who promptly said that she needs to adopt him from Joe and Val, he's that cute. I don't think that Sammee's new parents are going to let him go, so our house will remain a cat-only household for now. Anyway, enjoy your new puppy guys! Joe actually didn't stay too long at The Tobacco Hut today as he had just gotten the puppy and was anxious to help Val get Sammee settled into his new digs. Maybe next week he'll bring Sammee to the Hut for a meet and greet! By the way, Joe, when you come next week, we're running low on the peanut butter pretzels! Ed B came earlier in the morning but by the time I arrived around 12:30 or so, he was getting ready to leave for the day. It was great weather for Ed to be driving his orange Jeep around town, too. Finally, we're getting some average temperatures. Today was a perfect day to be outside, so I naturally chose to spend most of it inside at the Hut. The only other regular to show up was Adrian a little later in the afternoon, but more about that later. We had two new customers who found Lou via his website. One of the gentleman was visiting from Chicago, Paul F. I think the other fellow was his brother-in-law, or friend, or something, and unfortunately I didn't catch his name. But Paul purchased a cigar and stuck around to enjoy it. He's also a pipe smoker and we chatted a bit about all things pipes. 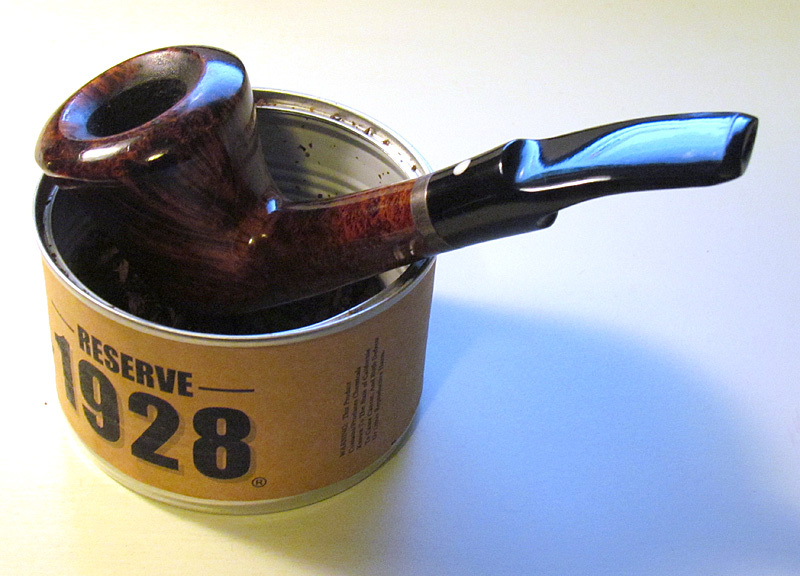 Chicago has some world-famous pipe and tobacco shops, including Iwan Ries & Co., one of pipe smoking's meccas. With over 15,000 pipes in stock, you can tell why I drool a bit just thinking of it. Every pipe smoker should make a pilgrimage there sometime in his life. Unfortunately, I haven't made mine yet, but someday. BTW, Paul, I hope you can make time in your trip for another visit to the Hut! Today found me puffing on a Mauro Armellini filled with Tinder Box Reserve 1928. I purchased the pipe from a Tinder Box in Savannah, Georgia back in 2005 and it has always been an excellent smoker. 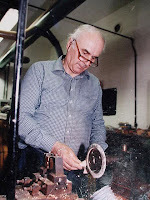 Mauro Armellini was a self-taught pipe carver who worked for Savinelli before opening his own studio in Italy in 1960. Although there are no distinguishing marks on the pipe to indicate when it was made, my guess it was made by Armellini himself. 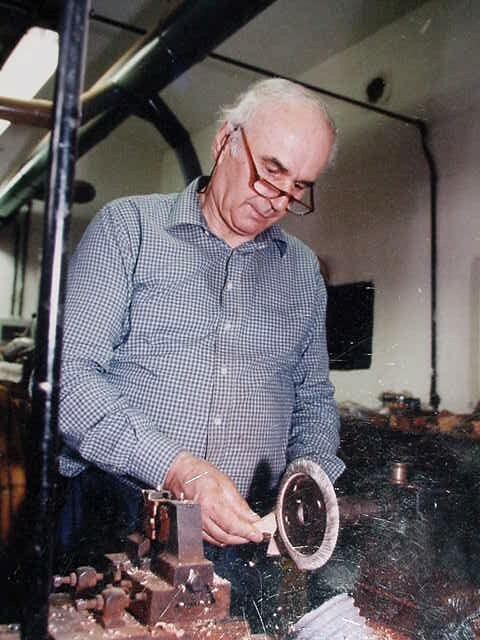 He passed away in 2004 and since then his daughter Wilma has taken over the business, not only the administration of it, but crafting the pipes as well. Whoever made it, hats off to you for carving a beautiful pipe! Lou informed me that Bret came in earlier in the week to pick up the pipe I gave to his son, Blake. Lou had cleaned and sterilized it and got it all ready for this new smoker. I hope you enjoy it, Blake, and hope to run into you soon at the Hut to talk shop! As I mentioned, Adrian arrived a little later in the afternoon, and it didn't take long for the chess rematch to begin. I had lost in our last meeting over the chessboard and was eager to avenge my loss. Adrian was just as eager to add a second victory to the records. Adrian brought a beautiful marble chess set with him (probably looking for a home court advantage) which we played on. I sometimes have trouble playing with highly decorative chess sets, like Revolutionary soldiers or Middle Earth pieces, but the men weren't overly stylized and stayed pretty close to standard Staunton pieces. How did the game go, you ask? We started off fairly even, although I picked up two pawns early on. Being up those two pawns would prove decisive much later in the game, but moving into the middle game it didn't make much of a difference. In fact, Adrian had his pieces doing a full court press on my king's position and I was getting more than a bit nervous. After quite a few tense moves, I was finally able to drive his queen back to a defensive position and could go on offense. In the end, we were exchanging pieces back and forth, and my two extra pawns proved to be an overwhelming advantage. It was an excellent game and really could have gone either way for quite a while. Can't wait 'til next week, Adrian! I just wanted to take a moment and tell you how fortunate I feel for finding another pipe smoker... not to mention someone else from the great state of Florida! I'm not too far from you as I live in the Tampa Bay area. I thoroughly enjoy perusing your blog. Thanks for the kind words, Dean! If you get the chance, we'd love to welcome another pipe smoker at The Tobacco Hut in New Port Richey. I'm there every Saturday from 1-5:00.